PowerMAG - Cortech Solutions, Inc. 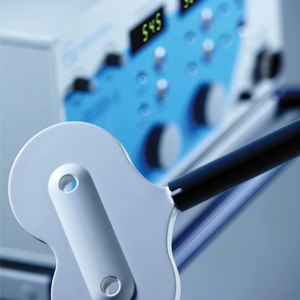 The PowerMAG LAB and PowerMAG EEG stimulators from Mag and More, GmbH are suited to a wide range of research applications. These repetitive magnetic stimulators meet all expectations of quality and sophistication for an advanced research device. PowerMAG systems are highly configurable, allowing us to provide a system with just the features you need, whether your application demands a lot or just a little. We not only provide a variety of rTMS simulators with all the relevant accessories, but we also provide innovative solutions for 3D neuronavigation. The PowerMAG LAB represents the top-class in TMS stimulators. It is able to generate burst of pulses up to 100 Hz with constant intensities by recharging between pulses. It also has an impressive maximum pulse frequency of 100 Hz at 70% intensity, making this stimulating device a perfect choice for the latest stimulation protocols, such as theta burst stimulation. The PowerMAG EEG was specially developed for the high-end research user who needs to stimulate while recording EEG concurrently. Powerful high-frequency TMS (including Theta Burst Stimulation) as well as high-precise single pulse and paired pulse protocols are available in one standalone device. In addition to the application areas above, the PowerMAG EEG systems are suitable for online TMS & EEG.